Has anyone still got Kasenit? If so could they to a photo of it? BTW; Some suppliers on Alibaba search may sell E535 in small quatities. If not try a lab supplier. Its the the contents we are interested in. Is it yellow or black/grey/whilte speckled? Attached are MSDS for Kasenit and two other commercial case hardening compounds. Very inconsistent, re. that MSDS and the actual product -- also in the MSDS itself it is listed as the "potassium" salt, but the formula listed in the MSDS is Na (sodium). Like I said, all this stuff is too iffy for me to feel comfortable experimenting with those ingredients. My next case experiment will probably be charcoal and sodium carbonate in a pack for an hour. And I might try wild cherry branches or leaves. "Cherry Red DIY surface harding powder. 400gm/14 ounces"? I came across it searching Ebay for "Case Hardening". Don't add "powder" to the search string or you get lead into all sorts of guff. I haven't tried it, Swarf, but it is the third of the MSDS pdfs I attached above. Came across this by powderkeg. Here is one that is also good and talks about how to harden specific parts of the piece. Thanks Steam, I admit to not looking at the MSDS pdf's as I am not intending to do any hardening soon. Interesting though to look now, as the product is sold as, "non toxic". MSDS starts with warnings that it causes irritation to Eyes, Lungs, Skin, and gut. Fair enough to take safety precautions with any chemical anyway. Being in the textile dyeing game many years ago, chemicals were handled with gay (the old definition ) abandon in my day - now we or should I say "I" know better hopefully. My son is into woodwork and I am impressed with him talking to his children whenever they come into the workshop about the No 1 rule "Be Safe". Thats exactly as I remeber it. It is obviuosly a mixture of things there are white crystals and at least on black powder. There seems to be no yellow at all. Reading through my machinery handbook they give a few recipes that use Cynaide for colour case hardenning (usually the Potasium Salt). They also state that if the colours are too rich leave out the cyanide! You need to pack the metal and the above mix into a loosley sealed box, or better (they say) into a piece of iron pipe closed at one end. Put all into fire at dull red heat for several hours. Case hardening is a slow process. At end take out and quench in water!
. Interesting though to look now, as the product is sold as, "non toxic". MSDS starts with warnings that it causes irritation to Eyes, Lungs, Skin, and gut. you'd be surprised at what not classed as toxic, recently did a chemical handling course and was informed that sodium hypochlorite solution isn't toxic, yet it takes less of it to kill you then chlorine gas! a competent engineer uses the tools and knowledge available, to get a challenging job done. Thanks Tom, both excellent! And somehow I had missed powderkeg's thread here. Too bad he never posted a hardening test. The other thread is very informative, though kinda funny since it starts out with practical experimental demonstration of something, and then devolves into a bunch of experts posing theoretical arguments about what is "best" in their opinion. Meanwhile the results of the simple experiment and proof at the start that non-toxic ingredients work as well, in actual home shop conditions, using available ingredients and equipment is ignored. One reason I like our own forum so well! More doing, and showing, less theorizing. Speaking of which, remember gentlemen, this thread is a challenge to throw your own iron into the fire and let us see the results! Had a look at the contents of my old tin of Kasenit yesterday and it has exactly the same appearance as Steve's tin. Will get around to trying my threaded hardwood and sealed baking experiment in the next day or 2......OZ. Looking forward to it Oz! I wish I'd seen this thread a few weeks earlier as I had pitted a whole bunch of cherries and dried them. The pits might be a worthwhile source of carbon however I'm not about to dig into my compost heap to try to recover them. Will have to keep this in mind as we use a wood fire in the winter and it will give me things to do while trying to stay warm. Can't locate here any Kasenit or such, but today in one local forum someone was sellig Potassium Ferrocyanide powder 5€/100g and remenbered this thread. Is this yellow powder as itself any good if I need to case harden small parts? How are other experiments doing? If you mix the potassium ferrocyanide with powdered charcoal and sodium chloride (common salt) this will work in the same way as Kasenit. I think I used a mix with equal parts of each component and it worked OK. I think you are missing the important variable in the sugar coated hardening experiment. Time. All the anecdotes would indicate that the diffusion of carbon into the steel is not that rapid. Only heating for three minutes is probably not nearly enough time. Mark, I did what was claimed for a sugar case hardening method. Do you have a reference for the anecdotes you mention which specifically use sugar to case harden steel over a longer period? I can tell you that diffusion of carbon into steel can happen considerably faster than 3 minutes. It happens in seconds with Kasenit, for a thin case. I was referring back to Andrew and Normans posts on page one. Ahh, they were talking about pack hardening there. The method previously mentioned for sugar was for a dip, heat, and plunge type and had its origins in a reference to "The Great Escape". Dip types have the advantage for speed and convenience. And hoping to find a safe homebrew alternative to Kasenit (a dip type) was the reason I started the thread. Jerry Sage who escaped from Stalag Luft III was a member of my father's parish in Everett (Washington) when I was a child. (1) The process described by Paul Brickhill was sufficient for the "soft" wire around many of the prison compounds, but not for the "hard" wire around cooler areas. 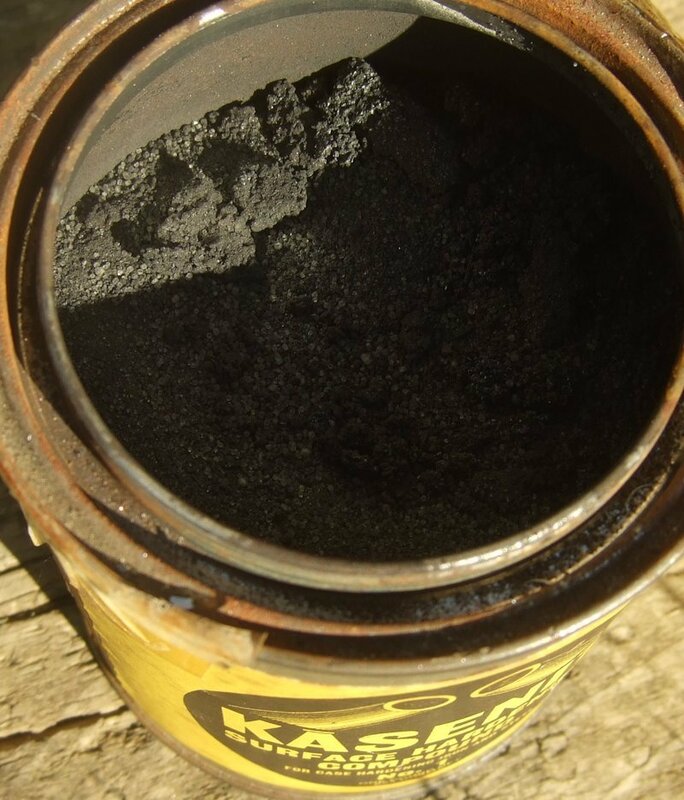 (2) Molasses or brown sugar were the "preferred" materials (but harder to get than white sugar) in Stalag's. And (3) the person who started this "process" around the Stalag's had read about it in a WWI escaper story. Folks, sugar in air didn't work here to produce any hardening effect whatsoever. I wasn't trying to prove or disprove historical events. If someone wants to try molasses or brown sugar on soft wire in a test, I'm all for it! And if it does harden to a useful degree that would be great. Likewise if you want to try it in a pack, please do! This was an invitation for others to help work out a useful quick hardening method. Nobody joined in, and the results are what they are. Don't like 'em? Do it better and write it up here! Photo links wrecked by Photobucket have been removed and photos restored.